As an artist, I’m constantly working on new projects and things! Here’s a big ol’ list of that kind of stuff, from current projects and comics to completed works! Check ’em out, if you’re so inclined! 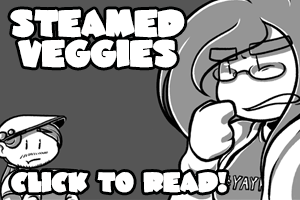 Steamed Veggies is a slice-of-life, semi-autobiographical comic strip (except when it isn’t) focusing on real-life stories of events and friendship (and maybe some philosophical waxing here and there.) It updates every Friday. A comic finished in May 2016 reflecting on life a year after college; on meaning, creative and emotional listlessness, and breaking down self-made barriers to create your life. Hometown Ghosts is a 21-page comic, avaliable for pay-what-you-want download on Gumroad. Paper Cranes is an interactive visual novel that follows the story of Hase, a young, troubled rabbit girl, as she attempts to escape from the Cells, a metaphysical prison crafted from her own insecurities and anxieties. Along the way, with the help of an empathetic guard–the aggressively protective Katz–she must face scenarios that echo the troubles that have tied her down to the Cells in order to come to terms with her own identity and embrace her own strength. 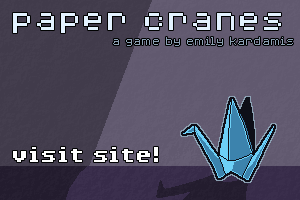 Paper Cranes is currently available for download on Gumroad, for pay-what-you-want (including free!). Since Paper Cranes was built with RPG Maker VX Ace, the file from Gumroad is a self-extracting .exe that contains all of the files for the game to run, including RPG Maker’s runtime engine. Visit the site or download the game! Aetas is an eight-page comic about what we leave behind when we die. Read it here!